Many a sport involving horses is referred to as ‘the sport of kings’ but, considering its right regal pedigree, polo is perhaps the most fitting claimant to this crown. And yet, there’s a new(er) kid on the block that similarly sees illustrious players up on their ‘high horses’, as JON RAWLINSON reveals. From soccer to rugby union, rugby league, American football, sevens, nines (the list goes on!) there are plenty of very different games which claim the name of ‘football’. Similarly, while polo and polocrosse are not exactly peas from the same pod, these equestrian codes share at least one major connection – they are both the domain of the Ainsley brothers of Pukekohe East. Kel and his brother, James (known as ‘Ross’), were born and raised rurally across the ditch. Both have represented high-goal (top level) teams, including Australia in polo, with Kel also competing for New South Wales and Queensland in polocrosse. Because polocrosse isn’t as demanding on the horses as the sport’s older cousin, only one mount (rather than at least two) is required per player. In addition, smaller fields – where the ball isn’t played along the ground – require less precise preparation. These factors can keep costs down for players. Despite this, these two horse sports also have some obvious similarities. Yet, code-hopping isn’t common while playing both at a top level is also unusual, he confirms. First introduced to polocrosse aged six, Kel (also a top showjumper in his youth) took to the sport immediately. It hasn’t taken me long to realise that whenever this Aussie-born battler’s heckles are up and victory’s on the line he pulls no punches! Although Ross isn’t on hand when I drop by, that’s not unusual; he’s somewhat more of a globe ‘trotter’, a walking (and riding) advertisement for the business than Kel, who (largely) holds down the fort at home in the country. 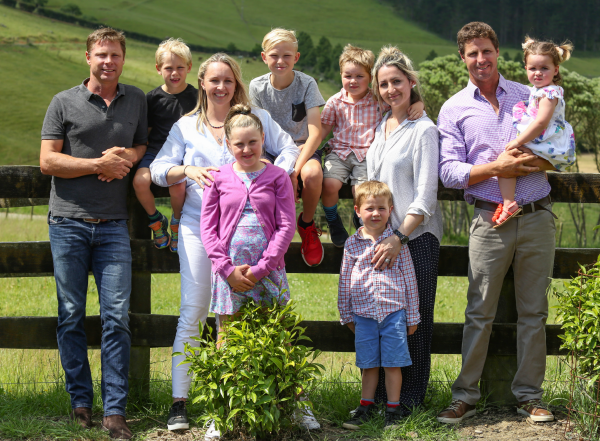 Since moving to their Pukekohe East property approximately 14 years ago, the brothers have built a successful business, known as Ainsley Polo, breeding and selling horses, tack and saddles, as well as providing training for horses and riders. “We chose Pukekohe specifically because it’s close to the airport for when international clients come over and when we go overseas to compete. Auckland Polo Club [based in Clevedon] is close by, too. “If we drive down the road for half an hour here, we’ll see 10 horses and probably try eight of them; if we did the same in Australia, we’d probably only see a couple and not try either. The size of the country comes into it but it’s more just about the quality of the horses New Zealand produces.”Matching the right horses to the top pros is no easy task and neither is breeding the best. Just a couple of years after settling here, ‘team Ainsley’ made a new selection when an English lass came to ‘town’ looking for a pony. Instead, she procured much more than she bargained for. Lucy no longer plays polo, but she does hold the reigns as far as marketing and advertising the business goes, while also wrangling the couple’s three children. The Ainsley brothers were practically born in the saddle so it’s no surprise that their children are following in their dads’ hoof steps. Lucy and Kel have three children together while Ross has also sired three youngsters, with his partner, Siobhan. Polo may have once been a right rural pursuit but, down here in the antipodes, it’s rapidly becoming a favourite of town folk too. Bringing a sport enjoyed by royal sorts to the common man – well as common as they come in Remuera – Heineken Urban Polo is an exhibition tournament featuring some of the world’s best players and horses… of course, of course. On February 24 at Shore Road Reserve, Remuera, Urban Polo takes place soon after the Land Rover NZ Polo Open – February 18, at Auckland Polo Club, Clevedon. While the latter is one of this country’s oldest and most prestigious high-goal (or top level) tournaments, the former also offers plenty of riveting ‘divoting’ entertainment, Kel Ainsley from the Glenfiddich team explains. Ainsley Polo will provide plenty of fresh horses for the affair, as well as ensuring professional players from around the world catch their plane in time to mount up. The Taupiri Polo Club (of which Kel is president and Ross, club captain) hosted its own event, Polo in Pukekohe, in December. The Ainsley’s property doubles as home ground for the Taupiri Polo Club since it was moved north years back; a name change is currently on the cards. For more information about Urban Polo or the NZ Polo Open, visit nzpoloopen.com or urbanpolo.co.nz; the next instalment of Polo in Pukekohe is expected to take place towards the end of this year – details via ainsleypolo.com.